Free crack inspection & crack repair estimate. Crack sealing with patented FlexiSpan® system. Structural repairs for cracked foundation walls & floors. A crack in your basement wall is sort of like a slow leak in one of your car’s tires. There’s no immediate danger, but sooner or later you’ll have to do something about it. It may be tempting to ignore a cracked basement wall (especially if you don’t spend much time in the basement), but the reality is that foundation problems can become worse when ignored. Most homeowners will often try to repair cracks simply by applying caulking material or epoxy. Unfortunately, this superficial fix does not stop water from filling the crack. If you find a wall crack in your basement and aren't sure what to do next, it's smart to call a professional who has the equipment and experience to handle basement leaks and wall cracks. Many Basement Systems dealers offer free inspections and estimates for repairing cracked foundation walls. Contact us today to find an expert in your area who can help! A fix that won't fail. The patented FlexiSpan® crack repair system from Basement Systems provides failsafe protection from leaking cracks. It seals the crack but also includes a hidden foam strip to channel any possible water seepage to the sump pump. FlexiSpan® provides two lines of defense: a crack sealant and a hidden, low-profile drainage channel that directs any leaking water to your sump pump. The drainage channel is permanently sealed to the foundation, and can flex in response to wall movement. Treat a cracked foundation wall sooner rather than later. Call in an experienced Basement Systems specialist to inspect any foundation crack and determine its cause and severity. Avoid “quick fix” repairs that won’t last. Foundation wall cracks create a pathway for water, insects and other pests to enter your basement. Radioactive radon gas can enter your basement or crawl space through a cracked foundation wall. Just like a wet basement, a cracked foundation will diminish your home’s resale value. A foundation crack that hasn’t been repaired is a red flag during a building inspection; it can make your home much more difficult to sell. What about more serious cracks in the foundation? Concrete has a tendency to shrink as it cures. This shrinkage can sometimes cause small "hairline" cracks in the foundation that don't have any impact on structural integrity, although they can allow water to seep into your basement. 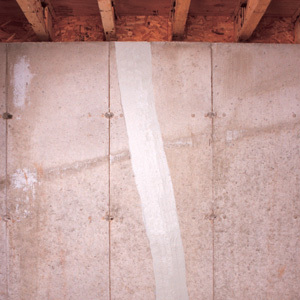 Some foundation cracks are more serious than others, indicating soil issues that need to be addressed as part of the crack repair process. For example, soil settlement can occur beneath a foundation wall, causing part of the wall to crack and sink into the settled area. Soil pressure from outside the foundation is another condition that can cause a foundation wall to crack and bow inward. In both of these cases, your Basement Systems dealer can recommend engineered foundation repair solutions that treat the soil issue in order to remedy the cracking problem. Don’t guess about a serious issue like a cracked foundation! 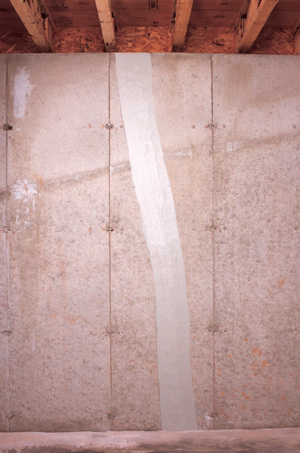 Is your foundation wall crack a minor problem that can be solved with a FlexiSpan® repair, or a major issue that indicates a serious structural problem? Instead of guessing about your foundation, call in an expert from Basement Systems for a free inspection and repair estimate.